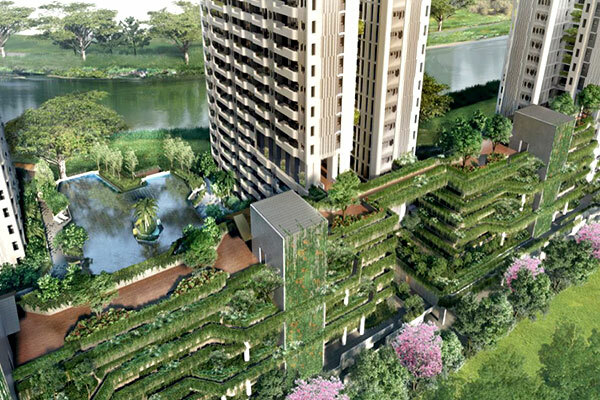 New launch The Tre Ver condo sold almost 70 per cent of units offered at its Phase 1 offer. The developers’ offer of steep discount lured in mainly first time home buyers to the new launch on August 4th (Saturday) amidst the new property curbs. The Tre Ver Condo is a 99-year leasehold brand new property launch, by UOL Group and UIC Industrial Corporation, located along Potong Pasir Avenue 1. This development, which is formerly known as the Raintree gardens, sits on a massive 201,405 sqft piece of land with a plot ratio of 2.8. The new launch is expected to be shaped into tower blocks and garden blocks that will comprise a total of 729 units with 1 to 4 bedrooms configuration. “We saw a strong take-up of more than 140 units within our first three hours of launch, which is more than 70 percent of the 200 units released,” said Jesline Goh, UOL’s senior general manager for asset management and marketing. She noted that most of the buyers looking at the 99-year leasehold development in Potong Pasir comprised Singaporeans and those aspiring to own their first house. With prices ranging from $738,000 for a one-bedder and $2.08 million for a four-bedroom apartment, the new launch expected to be completed by 2022 and situated near the Potong Pasir MRT station presented a strong value proposition to buyers. How much of your income should you spend on housing? One of the most interesting features of The Tre Ver is that it’s located just a few meters away from the Kallang River. The development is designed by WOHA, an award winning architects company, which will seek to preserve majority of the existing trees that line up the riverfront. The lush landscaping that surrounds the residential also seamlessly blends with the waterfront promenade to create a deep serene natural setting. That, plus the close proximity to the city makes The Tre Ver an ideal spot for those who want to enjoy upscale living without isolating themselves from nature. The Tre Ver has an array of shared facilities that can make life for residents quite enjoyable. Some of the basic facilities found within the condo include a 50-metre lap pool, indoor gymnasium, playground, kid’s pool, BBQ pits and 24-hour security concierge. The Potong Pasir MRT and Woodleigh MRT stations are located a stone’s throw away from The Tre Ver, both of which offer services via the North East Line. Those who want to access other parts of Singapore can use the Central Expressway (CTE) and the Pan Island Expressway (PIE), which are easily accessible from the residential. With the area’s comprehensive road network, getting to Orchard Shopping Centre and the Central Business District (CBD) can take a mere 15 minutes or less. Aside from the massive NEX Shopping Mall and City Square Malls, there are other notable shopping malls located near The Tre Ver including Bendemeer Shopping Mall and HDB Hub and the Venue Shoppes. There are also other upcoming malls such as Poiz Centre and Woodleigh Mall which can be easily accessed from the residential. That means shopping for residents of Tre Ver won’t really be a hassle. The Tre Ver residential is surrounded by a number of reputable local and international schools, which offer high-quality education to students of all learning levels. The schools range from primary all through to Junior college. And most of them are a walking distance or just a few bus stops away. Based on its unparallel views of the river and close proximity to the city, Tre Ver is prices are likely to be reasonably high. The residential area was bought at $334.2 million, which means the breakeven price will be about $797 per square foot (psf).Analysts expect the selling price for the condo to range between $1,500 to $1,600 psf. Register for a VVIP preview for The Tre Ver Condominium NOW and get your loan assessed also. Are planning to purchase a unit at a new launch but have insufficient or no funds at all? Don’t worry because iCompareLoan mortgage broker can set you up on a path that can get you a home loan in a quick and seamless manner. The broker has close links with the best lenders in town and can help you compare Singapore home loans and settle for a package that best suits your home purchase needs. Find out money saving tips here. Whether you are looking for a new home loan or refinance, the Mortgage broker can help you get everything right from calculating mortgage repayment, comparing interest rates all through to securing the best home loans in Singapore. And the good thing is that all their services are free of charge. So it’s all worth it to secure a loan through them.